As a collage artist, I spent a lot of time layering color upon color to give a piece depth and movement. I approach dyeing yarn the same way, and layering color upon color and glazing the finished skein produces some of my favorite yarn. This is a great approach for a novice dyer to use. Putting on layers of color and glazing will give you a lot of insight into how dye works on yarn. 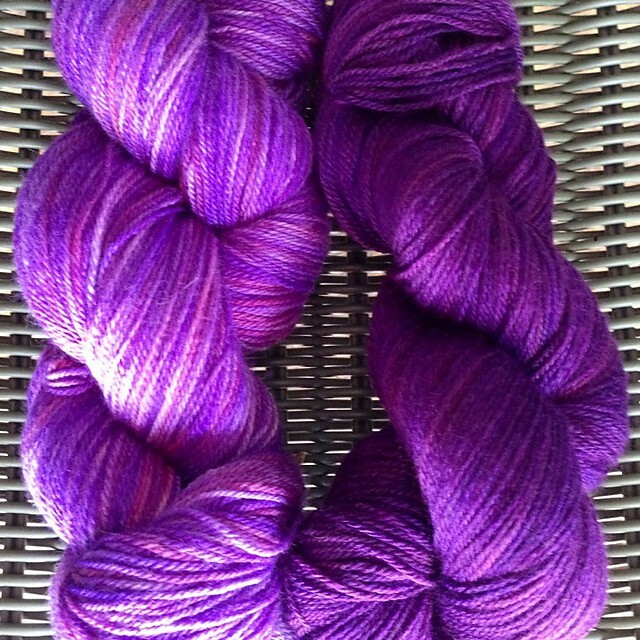 The skein on the left is the product of several dye baths, which gave it pale undertones shining through a rich blue-puple. The skein on the right has been glazed in a deep purple, which gives it a completely different look. You would not likely guess that the two skeins started life looking the same. In this next case, the skein on the left is dyed a sunny yellow-orange colorway. Unlike our example above where the glaze was a darker color in the same family, the skein on the right was glazed in a reddish brown. This focused on the color variation in the original skein and produced a mellowed brown skein with organic color changes. Glazing can also be done in lighter colors, or, more sparingly in black. The secret to glazing is to work with dye that will strike immediately and stay where it is placed. Some dyers work with a dry skein to maximize this effect. I typically work with a very hot dye bath and mordanted yarn, along with a damp but not wet, skein. Whatever the method, and as with anything else to do with dyeing color and fiber there are a multitude of way to produce beautiful results, dyeing and overdyeing skeins is a great method for both beginning and more advanced dyers to use. ← Dyeing Yarn with Natural Dyes. Part One. I really love the second overdyeing shown. Very interesting! I am hoping to get into dyeing soon and I love the different results you ave achieved. I googled glazing but wasn’t sure I completely understood the different terms. How is glazing different from layering the colour with different dye baths? Or is it just the term see for the final layer? Glazing and layering are different terms with essentially the same meaning, although much as in painting or collage, glazing implies a light overlayer, or perhaps one that touches in some places on a surface but not others. There are a lot of different ways to do this, and its some of the most fun you will have as you begin to dye!